In 2015-2016, the Edmonton Oilers missed the playoffs for the 10th consecutive season. They put up a 31-43-8 record, good for last place in the Pacific Division and second last in the NHL. Only the Toronto Maple Leafs had fewer points. Over the course of 82 regular season games, Edmonton came up with 203 goals and allowed 245 goals against. That’s a differential of -42. Due to yet another terrible season, changes were anticipated. And changes were delivered by general manager Peter Chiarelli, who traded top-scoring forward Taylor Hall to the New Jersey Devils in exchange for defenceman Adam Larsson. He also signed forward Milan Lucic and drafted Jesse Puljujarvi in hopes of bolstering the team’s chances. Naturally, the changing tide in Edmonton means that the one and only Connor McDavid will be set to fully emerge as the top player on the team. Many are anticipating the 19-year-old to receive the captaincy, which will help put a new face on the team as they move into a new arena downtown. 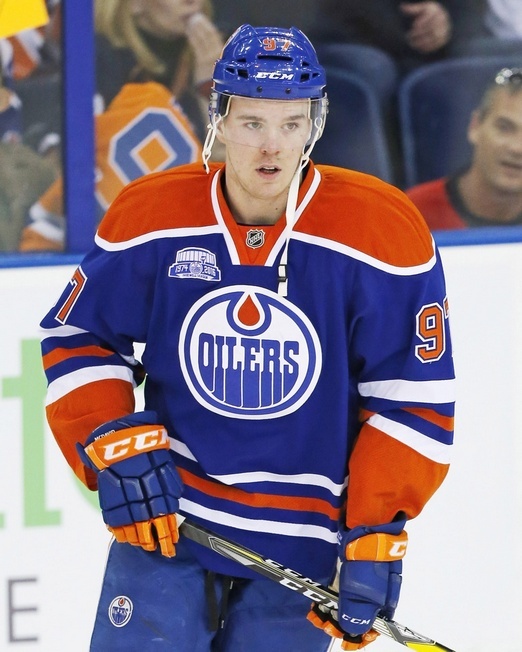 With McDavid, the Oilers have a once in a lifetime elite talent. He managed 48 points in 45 games last season, including 16 goals, and is one of the best players in the NHL. Edmonton will test his leadership abilities in 2016-2017 and there is some fear that the expected jump to the captaincy may put unnecessary pressure on him, but McDavid should bear the burden without much trouble. He’s a born leader. 26-year-old Jordan Eberle had 47 points in 69 games last season, including 25 goals. The Regina native is one of Edmonton’s most reliable offensive talents. He had seven power play goals and four game-winners. The knock on Eberle relates to defensive zone coverage, as things can fall apart in his own end. He also lacks the overall strength to win many puck battles. Lucic brings a game-changing ability to throw his weight around, which should benefit McDavid and Co. a great deal. The 28-year-old had 55 points in 81 games last season and averaged 17:14 of ice time a game. He’s 6’3 and packs 233 pounds of intimidation, which can lead to some bad penalties and questionable judgement. Ryan Nugent-Hopkins had 34 points in 55 games, including a dozen goals. He averaged 19:03 of ice time a game and gives the Oilers another option at centre. And Leon Draisaitl, who put up 51 points in 72 games, is yet another possibility down the middle. The 20-year-old averaged 18:03 of ice time a game and likes to dish the puck. With the acquisition of Larsson, the Oilers got better on the blueline. The 23-year-old Swede had 18 points in 82 games last season and is a poised player beyond his years. He averaged 22:30 a game for New Jersey and boasts an above average shot. Edmonton will hope to unleash that shot more often, which means Larsson could see some considerable power play time. Oscar Klefbom is another Swedish defenceman for the Oilers and another puck-moving option. He plays a shutdown game and is a terrific positional player. He averaged 21:53 of ice time a game last season and had a dozen points in 30 games. Injuries can be a problem due to a wild streak, but Edmonton likes his tenacity. Andrej Sekera is, believe it or not, the veteran presence. The 30-year-old had 30 points last season and played nearly 22 minutes a game. Sekera likes to move the puck, but he’s not very steady and lacks physical upside. Luckily, Darnell Nurse can bring the nasty. The 21-year-old from Hamilton will drop the mitts if need be and can put up big minutes. Caledonia’s Cam Talbot played in a career high 56 games last season and went 21-27-5, with a .917 save percentage and a 2.55 goals against average. At 6’3, 193 pounds, he has a great frame for the game. Talbot also has a positive attitude, which has helped the Oilers through some dark days. The knock on him is consistency. Jonas Gustavsson is a veteran presence and he can slip into the backup role without much hassle. He fills up a lot of the net, but injuries and rebounds can dog him. The Monster is flexible and athletic for a goalie of his size and the hope is that Edmonton will be able to lean on him to fill in some gaps. Puljujarvi, selected fourth at the 2016 NHL Entry Draft, is a good possibility to debut this season. The 18-year-old is 6’4 and 203 pounds, with great skating ability and a quick shot. Defensive zone coverage may be an issue, but he can improve as years go by. Goalie Laurent Brossoit is considered to be the goalie of the future for Edmonton. He was acquired in a trade with Calgary and finished last season as Talbot’s backup, but the arrival of Gustavsson will push him to Bakersfield for another stretch. That’s a good thing, as the 23-year-old netminder will benefit from further conditioning. This will be McDavid’s year. The plausible new captain of the Edmonton Oilers will have every opportunity to emerge. How he responds to pressure could make or break this franchise. The team is still young and thrilling, but Oilers fans are expecting more than just another “good try” when the dust settles on 2016-2017.